We here at Government Book Talk like to keep up with current events. It was really easy to do so on Tuesday, because the event conveniently came to us. Since I work at the Government Printing Office, where the movement of heavy equipment is not all that uncommon, I first thought that the vibrations I was feeling derived from a web press or other behemoth being shifted around downstairs. When my office began to shake, however, I was willing to reconsider my hypothesis – seriously reconsider it. Today, back at GPO (which, by the way, was built to last for the ages, as anyone who works here will testify), it occurred to me that a Government publication about earthquakes might be a timely subject for a blog post. I checked in with the U.S. Geological Survey’s Earthquake Hazards Program. Very cool! There are links for reporting an earthquake, “shake maps” (left) for depicting shaking intensity (and now I know what that shaking feels like! ), and best of all, a page about our very own 5.8 Virginia special, which occurred at 01:51:04 PM at epicenter (I admit it – I didn’t look at my watch). My favorite page, though, is a tectonic summary of the quake with a link to earthquake information about the Old Dominion that includes lots of resources. After all, I live in Virginia and like to keep up with the happenings, especially when those happenings make things fall off my shelves. Also, if you have a plotter, you can print out a poster and hang it on a wall – as long as you’re confident that another “event” will let it stay there. Well, time to start thinking about this weekend’s hurricane – National Hurricane Center, here I come! This entry was posted on Friday, August 26th, 2011 at 9:31 am and is filed under U.S. Geological Survey. You can follow any responses to this entry through the RSS 2.0 feed. You can leave a response, or trackback from your own site. Very nice blog, I look forward to more texts! no hay que ser un genio para darnos cuenta que se viene uno bien grande,seguido del mas grande sunami, podria ser de grado 10.y su duraion no seria menos de 8 o 9 minutos, eso me da miedo no tanto por no poder escuchar sus ondas p, y no me daria tiempo a evacuar, asi sean 10 metros. my Internet line.I can’t register my name for recieving your news / articles. I hope you are fine. Its Kianitabar here. Basically I’m a male psychologist.I ‘m translating different books in the field of human life to my mother language Persian. Also I have 20 bainchilds regarding social life , sending them to related institutes. Imaging if a disaster happens in a city with population of 5,000,000 .There is no difference between Earth quake , Hurricane , tornado , Rampant flood. Since the people suffer of its disadvantages. Only imagine, many children who are far from home, are injured and confused because of loneliness. Adults , bleeding are trapped in the streets, working places . Due to damages in communication systems, blackout and destroying administrative Blngs , hospital social workers and Red Cross helpers will not be able to contact to relatives of victims to offer information to them. In many cases , the injured persons , will find their families and transfer to their home lands after days.Many people , are unconscious and have not Id Card with themselves. For relieving People affected in disasters, I brainchild Necklaces, Wrist Id, Calf Ids. In the cities with high risk of disaster , state should send questionnaire to all residents asking if they are injured during a disaster or accident, whom they like the most to be informed and taken to. In which addresses. Then , the people in charge of , should refer to those address, one by one and find its GPS characteristics, register in documentation. Then, they should make necklaces, Wrist and calf Ids for the address of residents free of charge. Necklaces :In my opinion should be made of metal. Not flammable because of probable fire. The name of person, Id card No. and the GPS number of holder must be printed in it. Wrist and calf Ids ; should be made of cloth Strip , Cotton Band, Making pleasant the holder to fix it in hand or foot. The name of person, Id No., Geological GPS number , Blood Group and health statues should be sewed in it. In the cities with high risk of disaster, the residents should wear these all the time , everywhere they go. Sono un appassionato italiano di Geologia, Tettonica a Placche, Terremoti, ecc., autodidatta, e ricevo dall’USGS le schede dei terremoti nel mondo in quanto sono iscritto. – La zona della Virginia colpita qualche giorno fa da un terremoto è considerata zona sismica? – Washington, D.C. rientra in quella zona? – Nella stessa zona esistono delle faglie interessanti? 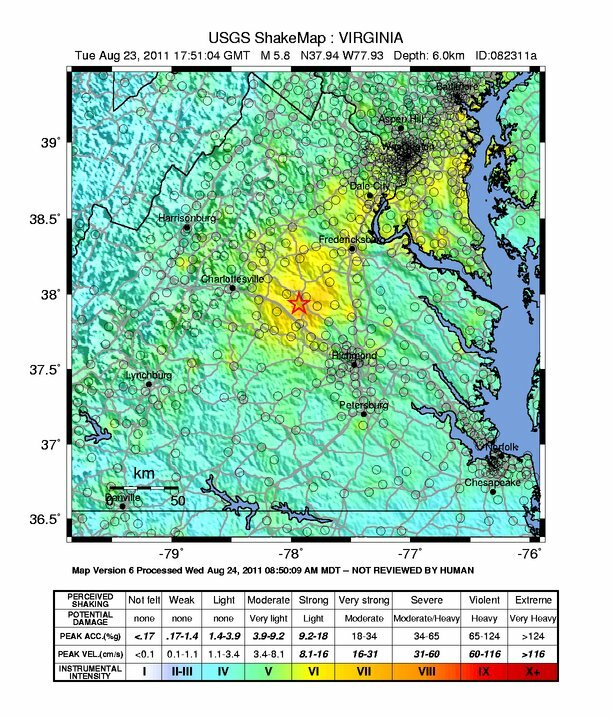 Virginia is not usually considered to be an active seismic zone. The USGS Web site has more information, but my understanding is that Washington, DC is not on a fault line. yesterday we have an earthquake 7 degree , was sense in all the country, more than 120 km deph. very strong.